Contemporary Carriage House privately sited on a hill overlooking a view of the Taconic Hills, this architect-designed three bedroom residence was inspired by the lines of the Hudson Valley&apos;s Carriage Houses. An impeccably styled home that combines contemporary design with the warmth of a country home. 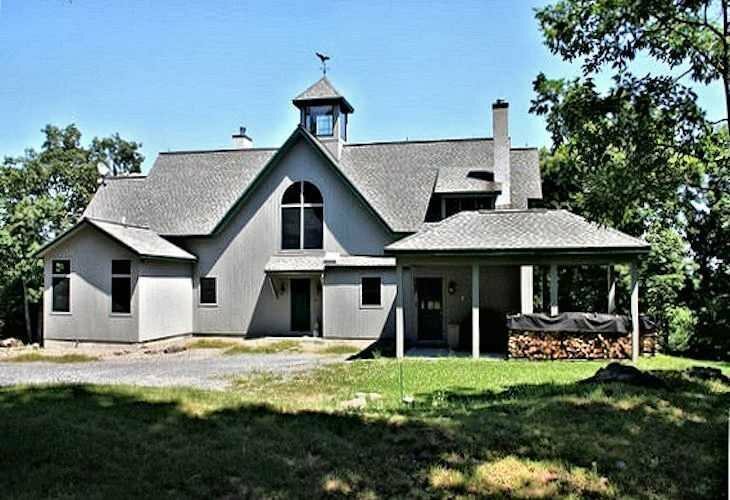 A light and spacious home with a dramatic Great Room, impressive with its soaring ceiling, striking wood beams, cupola skylight and custom windows and doors that bring in light and showcase the natural beauty of the 66 forested acres surrounding the house. In addition to the living and dining spaces in the Great Room, you will enjoy cooking in the well-equipped kitchen, complete with high-end cabinetry, limestone countertops, stainless steel appliances, and a walk-in pantry. Enjoy the convenience of a first floor master suite with full bath and an office that boasts spectacular views of the landscape. Off the Great Room is a cozy den complete with built-in cabinetry for large screen viewing. Just steps away, a three-season porch offers easy access to the living spaces. Warm wood detailing throughout the house with a well-designed lofted area over the Great Room that offers two bedrooms, a full bath and an additional office or gaming area.The lower level with its carriage house exterior features 4 garage bays, storage room plus a heated workshop.The 66 acres of maintained forested land are currently used as walking and riding trails. This pristine land is protected with a non-build conservancy that is renewable. This program offers a significant tax reduction benefit. It&apos;s gracious country living surrounded by nature and privacy on top of the hill and close to Rhinebeck.